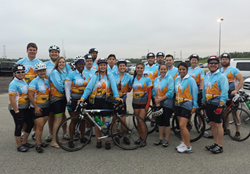 Mostyn Law’s MS 150 team members ride to raise money for multiple sclerosis research. My favorite part of the ride is coming together at the finish line to celebrate all the volunteers that work so hard to make this event successful. On Sunday, 20 members of the Mostyn Law team finished the 150 mile MS 150 bike ride from Houston to Austin, the firm’s fifth year of participation. Team Mostyn Law’s riders started their journey in Houston on Saturday morning and finished in Austin on Sunday afternoon. Saturday night, Mostyn Law provided its team members with food, lodging, and massages. Members of the team participating in the Mostyn Law nutritional boot camp were provided with raw plant based options catered to their diet. Mostyn Law team members finished their ride on Sunday and were treated to food and massages in Austin. In addition to providing massages for team members, Mostyn Law also gave free chair massages to any participant of this year’s MS 150. Riders crossed the finish line this year in a sea of bubbles from the Bubble Bistro, a tent sponsored by the Mostyn Law for people living with multiple sclerosis (MS). Those sitting in the Bubble Bistro got front row seats to watch the finish and were provided with bubble guns donated by the Mostyn Law. Participants in this year’s MS 150 were required to raise $400 per rider but Team Mostyn Law set their goal higher at $1,000. The team was able to raise over $30,000 and according to the MS 150 website, the larger event raised over $15.4 million. Funds from the event go to the National MS Society to fund research and provide services for people living with MS.
To learn more about the MS Society and the MS 150, please visit http://www.MS150.org.